It had been about 3 years since I was last at Dunderberg, so this trip was long overdue. 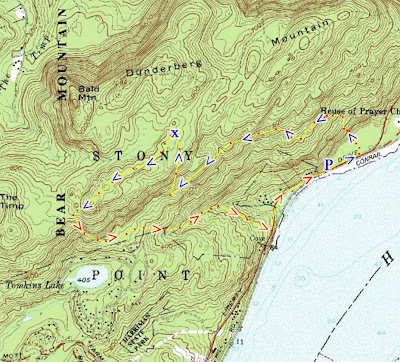 Dunderberg Mountain jumps out of the Hudson River with its very steep incline. The mountain is full of remnants of an abandoned railway that was partially constructed in the 1890's for a hotel on the top of the mountain. This was a very hot and muggy day, which restricted the views and made the extensive uphill very uncomfortable. We parked on Route 9W at the trailhead parking across from the Anchor Monument along the Hudson River. We started at the trailhead of the T-T and R-D where they confluence for a short time, and then veered off on the T-T Trail, along the old abandoned railway bed and the tunnels. Continued up the mountain to the viewpoint where Indian Point is clearly visible across the river, and went further until the intersection with the 1777 Trail, which we took south and then east down the mountain. View from inside the tunnel looking out. At the viewpoint after the bend. Indian Point Nuclear Reactor across the Hudson River. The heavy haze makes it hard to see. Me at the Anchor Monument, with Indian Point behind me. great hike!! looking forward to doing it.